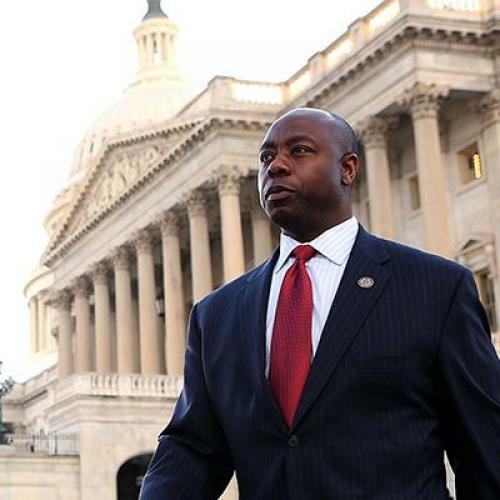 Nearly all accounts of Rep. Tim Scott’s appointment to South Carolina’s vacant Senate seat mention his race. He will be the first African American senator from the South since reconstruction, and the only black Senator in the body. His race has been made all the more prominent because he’s a Republican. “[M]odern black Republicans have been more tokens than signs of progress,” read one op-ed in the New York Times. The preoccupation with Scott’s race, however, obscures his considerable political talents. For as long as he’s been in politics, Scott has had a knack for navigating the complex internal politics of the GOP. Armed with an ever-present smile, Scott has been able to be all things to all people. He is an insurgent Tea Partier beloved by the House leadership who keeps his constituents happy with the occasional pork project. In a Republican Party that is constantly at war with itself, Senator Scott will offer much more to the GOP than the color of his skin. Scott was elected to Congress in 2010’s Tea Party wave, and he allied himself with the most strident members of the House. As one of 19 Freshmen to join the Tea Party caucus, he co-sponsored multiple balanced-budget initiatives and voted against raising the debt ceiling in the summer of 2011. In September, he was one of 28 freshmen to vote against funding the government for six more months. He is, in other words, exactly the type of congressman who’s been causing House Speaker John Boehner major headaches as he struggles to maintain party discipline. “He threaded the needle beautifully,” says fellow member of the South Carolina delegation, Rep. Trey Gowdy, explaining that even though Scott voted “no” on the debt ceiling in the summer of 2011, he didn’t go on television to question the conservatism of those who had voted yes. This is, in part, an effect of Scott’s general amiability. But it’s also the mark of a smart politician. Before he came to Washington, Scott aligned himself with Minority Leader Eric Cantor (then the Minority Whip), telling Newsweek, that Cantor was “the man I admire most up there.” His fellow South Carolina Congressman, Jeff Duncan, told me that Scott made it his goal to pursue a relationship with the party leadership when he started his term. Scott has also managed to maintain his credibility as a fiscal conservative while making sure his constituents got their share of federal money. Even though he has been vocal about eliminating earmarks, Scott has used a process called “lettermarking” to funnel federal funding to his district, according to an analysis by Think Progress. And, against the wishes of Senator Jim DeMint, whose seat he’ll take over, and other members of his delegation, Scott voted in favor of re-authorizing the Export-Import bank because it benefited Boeing, a company that provides jobs in his district. This pragmatic streak sets him apart from DeMint, who once opposed a project to deepen the port in Charleston, even though it would have benefited the state economically, because of his unwavering opposition to earmarks. The Democratic Mayor of Charleston, Joseph Riley, says he expects Scott will be a less ideological senator than DeMint and more willing to support projects that will help South Carolina. “Tim will do well being the same Tim he’s been all along,” he says. Scott will have to run for reelection in the Senate in 2014, and though he is well liked in his district, he’ll have a bigger challenge with the statewide electorate. If his past record is any indication, however, he should prevail. Scott has said he plans to limit himself to two terms in the Senate, but Republicans will want to hang on to him for longer than that.